Growing up I thought that mushroom meant those little white button mushrooms that you buy in a blue styrofoam container. But eventually I discovered the world of mushrooms, and what a wonderful world it is! 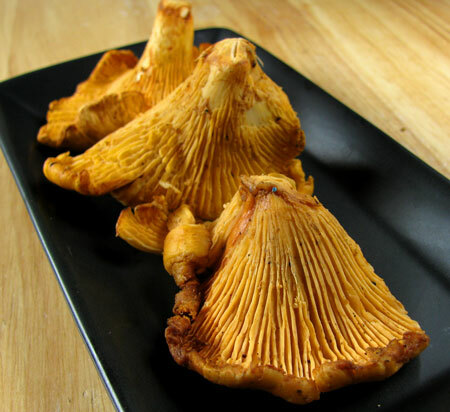 Mushrooms vary in texture and flavor, and one of my newest tries is the lovely chanterelle mushroom. These chanterelles were foraged in the wild of Washington, and I used them in my local and seasonal Christmas dinner party. I love their delicate wrinkly texture, it reminds me of the thin skin on the face of an elderly woman. They have a slightly peppery taste and are very high in carotene which I guess gives them that orange color. 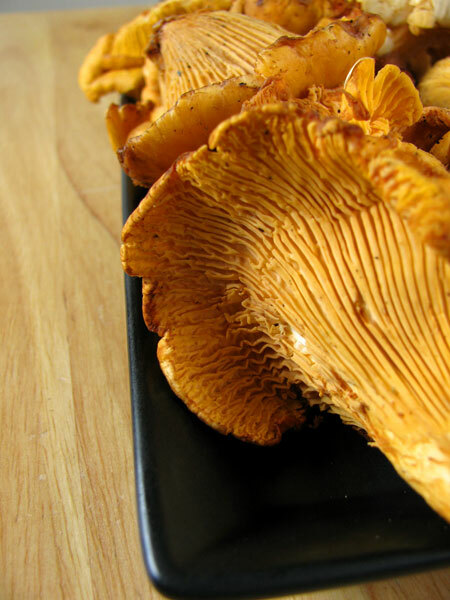 I think the taste of chanterelles pairs really well with chicken or beef. So I did both in this recipe, using local beef (from Auburn) and chicken stock that I made and froze previously from local chickens (also from Auburn). I served this over a summer herb pasta I bought at the farmer’s market in the summer. For a gluten free option you can definitely serve it over rice. Chop the steak into very small bite size pieces. Heat a large skillet on high and add chopped steak. Stir frequently for 2-3 minutes or until just browned. Remove steak from pan but leave the drippings. Add butter to pan and return to heat. When melted add garlic, onion, and chanterelles and turn heat to medium. Stir until garlic and onion are softened. Add cream and chicken stock. Mix well and simmer 5-10 minutes, until reduced and thickened. You can add more chicken stock to get consistancy you want. 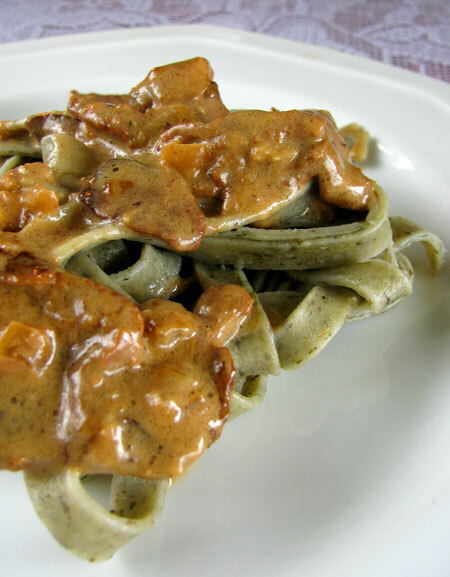 Serve over hot fettuccine. Approximate cost/serving: This served 10 as part of our multiple course meal, but I think is more reasonable to serve 6-8 with side dishes. You can use top quality sirloin because it’s being stretched so far among 8 people. Ours is very affordable since we bought 1/4 a cow. The whole dish cost just under $5 to make, so that’s about 63 cents a serving. Pretty good for such a rich tasting meal! Vegetarian/Gluten Free: This would still be amazing if you skip the beef and use mushroom or vegetable stock instead of chicken. For gluten free use rice rather than pasta. That looks gorgeous Diana. I actually didn’t like mushrooms until a couple of years ago. Now they are one of my favorite foods. I love your mushroom pictures and that this meal. I also love that you were able to stretch just 1/2 pound of meat. I’m always striving to do the same thing to keep my meat consumption down and flavor up. Looks great. I used to hate mushrooms before, I didn’t get into them unti the last couple of years. Don’t think I tried the chanterelle kind. I’ll have to get me some next I go shopping. That looks very delicious. I would love that for lunch. Looks simple to cook. Thanks for sharing. Looks delicious! 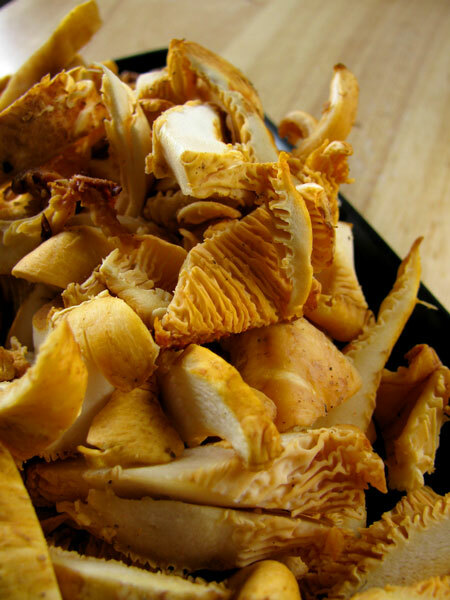 I am loving that one can get fresh chanterelles right now! Your pasta looks delicious too – was it homemade?